The Yuanmeng (which means “dream”) isn’t a work in progress – it’s actually flying, taking off for the first time from Xilinhot in Inner Mongolia. 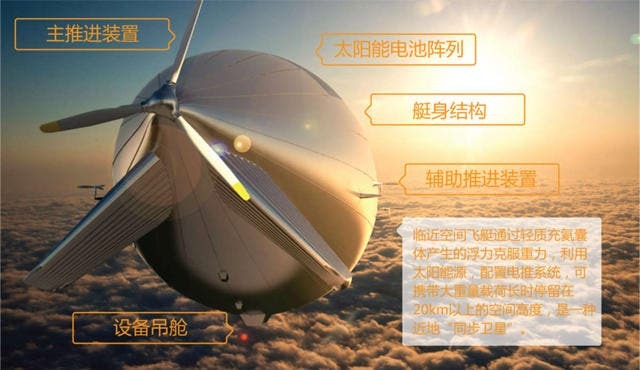 This 250-foot giant airship rises like a balloon, because it’s filled with helium, but as it reaches its cruising altitude, it accumulates energy from the Sun and can be cruised. The initial trial lasted for only two days, but reports say that it can fly for up to 6 months at a time. The thing is, we still don’t know exactly what its main purpose is. It can survey the ground, it can gather atmospheric or climatic data, but it can also act as a military station and guide jet fighters. Popular science speculated that the shuttle might be used for radar and imaging. Its broad line of sight could give it vision against stealth threats such as cruise missiles, giving them a larger chance to detect and shoot down such threats. But I’d like to think that the main purpose is scientific, or commercial. Just like large ships can carry huge loads cheaply across the oceans, so too could airships. Even smaller airships can carry loads of 50 tons. Of course, in some future, they could also replace commercial planes as providers of low-cost travel. They aren’t fast, but they don’t pollute and they’re much more sustainable than existing options – although the helium crisis might be an impediment.